The great strides made over the past decade in the complexity and network functionality of embedded systems have significantly enhanced their attractiveness for use in critical applications such as medical devices and military communications. However, this expansion into critical areas has presented embedded engineers with a serious new problem: their designs are now being targeted by the same malicious attackers whose predations have plagued traditional systems for years. Rising concerns about data security in embedded devices are leading engineers to pay more attention to security assurance in their designs than ever before. This is particularly challenging due to embedded devices’ inherent resource constraints such as limited power and memory. Therefore, traditional security solutions must be customized to fit their profile, and entirely new security concepts must be explored. However, there are few resources available to help engineers understand how to implement security measures within the unique embedded context. 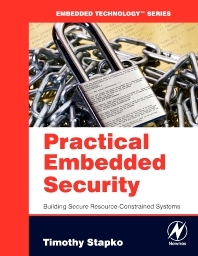 This new book from embedded security expert Timothy Stapko is the first to provide engineers with a comprehensive guide to this pivotal topic. From a brief review of basic security concepts, through clear explanations of complex issues such as choosing the best cryptographic algorithms for embedded utilization, the reader is provided with all the information needed to successfully produce safe, secure embedded devices. The ONLY book dedicated to a comprehensive coverage of embedded security! Senior Software Engineer, Digi International, CA, USA.